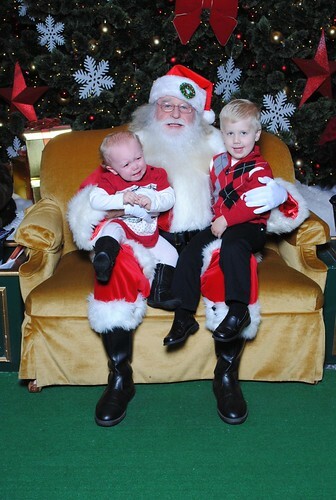 We took the kiddos to see Santa this past weekend. And just as we pulled into the mall parking lot bright and early on Sunday morning, who pulls in next to us? Brynn couldn't escape fast enough, while Carter happily sat on Santa's lap and told him everything he wanted for Christmas. He was a little upset when Santa didn't have all his presents wrapped and ready for him before we left though. He he. Love it. Mine looks very similar. I will have to post it next week. Those are priceless, especially that first one. Oh the memories... lol. So cute! This will be my first year with two kids instead of one! And I hope next year Brynn loves Santa as much as Carter seems to this year! Brynn and Evelina even sported the same outfit in their Santa pics!! LOL! So cute... I lucked out this year & got very cute, happy smiles. Is it weird that the picture with Brynn & Carter and Santa of course, instead of seeing a wreath on Santa's hat I saw a Starbucks logo?!? At first, I was all that's odd, humph, must be sponsored by Starbucks. I haven't had my coffee yet, can you tell? 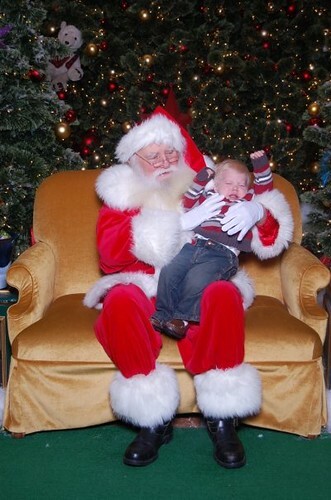 LOL we have Santa pics tomorrow and I'm totally scared! Any tips? My best Santa photo features me on Santa's lap with #1 on my lap. I was about as big as Santa at the time. It is ridiculous. Cute story and picture. I love the part where your son is expecting the gifts right away. I have to say that is a pretty spiffy looking Santa. Precious! I love that Santa drives a red volvo. Upgraded from that sleigh, huh? E is going through this strange scared of strang men phase so I anticipate the Santa visit will be loud. And tearful. its mean to force your kids to sit on a strange mans lap just so you can get a photo op..why not wait until they are not terrified? what is the big obsession with santa pics ?